The Heartbleed OpenSSL bug can leave a lot of systems open to exploitation. To see whether your system is vulnerable try the following. *I am using Ubuntu, but if OpenSSL is installed on your system, the commands should be similar. The command should output the OpenSSL version number. OpenSSL says you should upgrade to version 1.0.1g. If you manually installed OpenSSL, get the latest source, and install it. If you are on Ubuntu, you should also look at the "built on" date. If the date is on or after April 7th, then the patch has been applied. If the date is before April 7th, do a dist-upgrade to update. Apt-get upgrade will likely want to upgrade a number of packages, many of which are potentially vulnerable to the attack. Once the upgrade is complete, the "built on" date should be on or after April 7th. 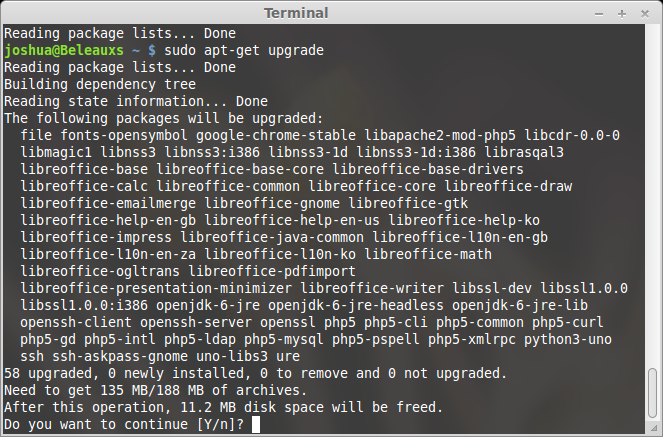 Patched OpenSSL installation on Ubuntu. Note, the version is still 1.0.1e - make sure to check the build date. Make sure you reboot your system to make sure the changes are applied. Many vulnerable products will likely be pushing out updates soon. Make sure you update all your devices, including mobile phones and routers.